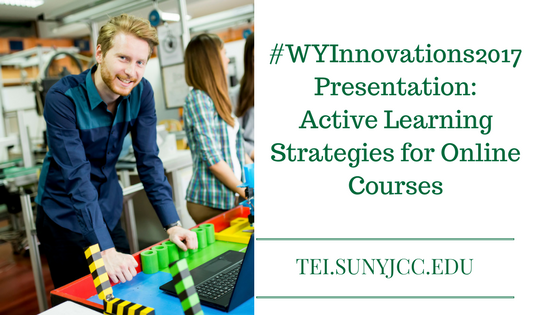 While attending the Wyoming Innovations in Learning conference, I sat in on a presentation focusing on active learning strategies for online courses given by Tim Kochery, a Senior Instructional Designer at Laramie County Community College. He began his presentation by defining active learning. Students need to explore for meaning and not simply have information handed to them. They need to wrestle with the content in order to find meaning. Kochery discussed a number of theories and frameworks to assist with active learning. The theory begins with an activity or experience that the participant then reflects upon. This then leads to new ideas that are experimented with. While all four stages are essential, I believe the key stages in terms of this presentation are the concrete experience and reflective observation stages. The key to me was that students need to be working on real-world problems. Students will acquire new knowledge as they work to solve the problem. It should be through their exploration. This learning process can be hard and messy compared to simply providing learners with content. Kochery shared a number of strategies for increasing student engagement. I have added links to resources for further discovery. Self-reflection and academic performance: is there a relationship? Videos are a great place to start engagement. You are recommended to find or create videos that are 2-10 minutes long. To increase engagement, use guided questions and follow up questions. Videos can be used as part of quizzes, polls, and problem sets. They can be used as part of reflection exercises or discussions. Assign 2-3 videos and have students compare and contrast. Students can also be tasked to find a video that is reflective of the content being discussed. Introduce netiquette early in the course. Have students write original posts to the question before viewing other student comments. Encourage the sharing of resources. Use the Socratic method as a means to draw out the discussion. Instructors can be discussion killers if they provide definitive answers. Treat a discussion like an interview as you engage students. Studies show that students want instructors to be more involved in the discussion. At the end of the discussion, do a summary. This was an informative presentation on different strategies to use in an online class. If you would like to explore these or other strategies, stop by the TEI Synergy Center.